Have you ever had a project that you wanted to take out in the back 40 and smash to smithereens? No matter what you try, what route you take, what deadline you extend, it just ain’t working out right. Sometimes smashing your design to pieces is a good thing and makes you see that, in fact, something remarkable was sitting there the whole time and you just couldn’t see it the right way. 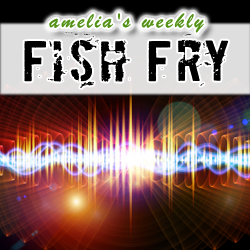 In this week’s Fish Fry we’re checking out how a research team at Rice University smashed their silicon film design and, in the process, may have discovered a huge battery technology breakthrough. We’re also checking out the newest Raspberry Pi camera module released by RS Components and chatting with Mark Winters (Senior Director of the Qualcomm Tricorder X PRIZE and Nokia Sensing X CHALLENGE) about the trends in MEMS in medical and consumer devices, and what the Qualcomm Tricorder X PRIZE and the Nokia Sensing X CHALLENGE are all about. Also this week, I announce my plans for December 8th and give away one more (this is your last chance!) Spartan-6 LX9 Microboards courtesy of Xilinx.